Dust Tracking is extremely important in several industries, including for example the mining industry, where dust from mining activities can be a huge problem. For this application we provide a 3D scanning system which is capable of tracking dust in real-time, provides 3 dimensional range-corrected scans showing exactly where dust is located, and can be pre-configured to send out an alarm signal if required. The system can be pre-configured so that the user can have little or no involvement. Using advanced scheduling software the system can automatically scan in any directions and at any intervals. These settings can be factory pre-configured, or can be adapted during installation according to ground conditions. An Engineer is sent to install each LIDAR, who can advise on the best location for the instrument (in collaboration with Site Managers) and who can ensure the system settings are optimal. The Engineer also provides training in operating the system, including how to perform more advanced data analysis, if required. A decade of design has led to extremely robust products. Our LIDARs have been tested and used in extreme environments, from the Amazonian Rainforest to a high altitude mine in the Andes mountains. LIDARs are sealed against dust and water. Wipers can be added to aid clearing windows and environmental control can be added for extremes of temperature. 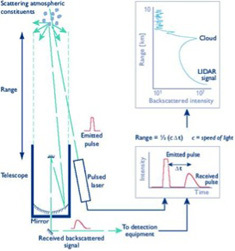 As shown in Figure 1, LIDAR works by transmitting short laser pulses of high energy into the atmosphere.‘Light’ is scattered back from molecules, aerosols, dust and particles and received by a telescope. The energy is measured by sensitive detectors and digitised. Time is porportional to distance, so a range-resolved signal is derived. Data is processed and graphically displayed. Alarms can be pre-set in factory to provide warnings if certain user-specified levels of dust are detected. The LIDAR Engineer performing the installation can help to ensure warning levels are set correctly. Alert messages can be sent out automatically via any means – e.g. email or even text message. The LIDAR can be provided as part of a complete solution, incorporating data from a weather station and an in-situ dust monitor. The LIDAR can be fully controlled remotely. A product brochure is available, or contact us to enquire about a complete system to suit your requirements.